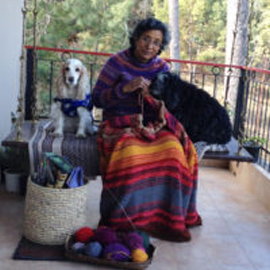 Avid knitters in India have to get their thrills about yarn by either trawling through websites like this and waiting for someone to bring it to them, or pay some huge shipping bills and track the parcel through every warehouse till home. Pure merino or lambswool aside, even finding unusual variegated yarn is a miracle. We console ourselves with some standard yarns, and most of our unusual ideas just remain floating in a limbo. It was a surprise, therefore, when one of our knitting circle members unearthed this website and shared the existence of a soft, single ply, acrylic yarn with long colour changes in soft shades. The combinations were smart and soothing to the eye and they were begging to be taken home. Being a strong willed, self controlled knitter, I immediately got 4 balls each of two complementing shades of Crypto from Pradhan Embroidery Stores, a website which can put you off by its cut and dried, no-nonsense look. My dear crafters, do not give up so easily–check out this site for many a goodie and gem, for knitting, embroidery and crochet. 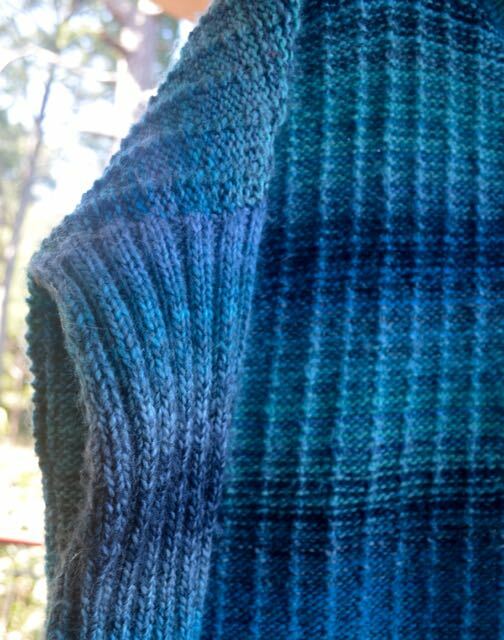 I chose to knit with two different shades, so that there was minimal pooling of the shades, and the sweater had an overall variegated look. My choices ( always in blue) were Shades 1424 and 1434), but one can try 1437 and 1436, 1416 and 1428, or any other shade which appeals. 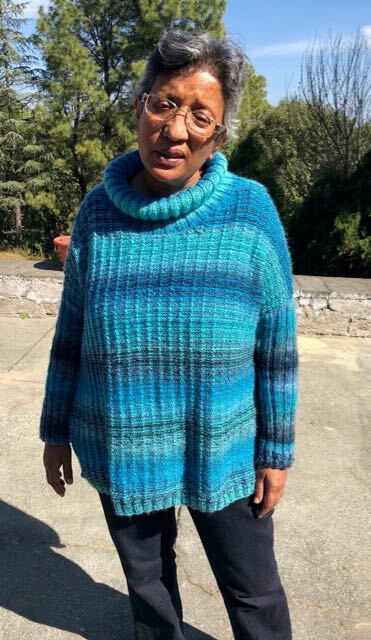 I chose a straight, very loose sweater ( positive ease of about 8 “) with a roll collar ( to keep my little neck cosy) and ribbed, slim sleeves which have been knitted from the drop down shoulder. 20 days of knitting and watching some good movies on TV, and my sweater is ready for this winter! To say that I am delighted, is the understatement of the year…I am thrilled and over the moon. The sweater is soft and easy on the body, I can layer a million things below it, the slim sleeves keep me warm, and the colours are just right for my minimalist wardrobe. There are a few neat ideas in this sweater, adapted from the Birch Bay pattern on the Brooklyn Tweed website. The drop down shoulders have a gradient casting off sequence, to avoid unsightly bunching up on material at the armhole. While knitting the roll over collar, the initial rib ( half the length) is knitted on smaller needles, before moving to larger knitting needles and ensuring that the ribbed collar rolls over by itself. 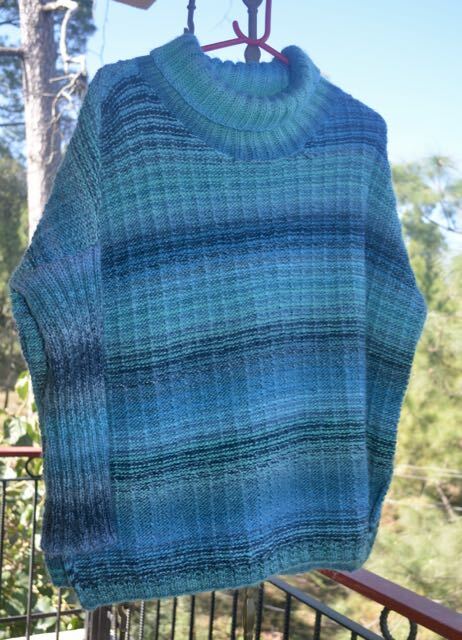 While the body of the sweater is knitted with alternating rows of both shades, the sleeves are in one shade, and the collar in the other, since untangling balls of yarn is not a hobby I fancy! Try out this lovely yarn…..Better still, try out the original Birch Bay pattern with some good quality pure wool, and enjoy the experience of knitting it, wearing it and getting complimented every time! I so love the colours of this sweater. hee hee…thanks! are you talking about the hanger?! I meant the lady with the glasses! oh yes, oh yes…I was wondering if you like being mentioned in open social media forums!! All the credit to my devoted daughter, who had to trudge to Pradhan stores, check out the range, send urgent Whatsap messages ( which weren’t noticed by hermit mom), buy and stuff them into her luggage! I can understand and feel for you. I know how annoying that whole work can be especially when parents don’t pick up or respond. I’d love to buy one like this Maya.